Will We Divorce Our Cars at the End of the Road? Every so often, it seems, we need a literary reminder of the issues troubling our automotive love affair, and there emerges a full-blown critique of car culture. I base this judgment on the periodic release, over the last few decades, of several books fitting this description. 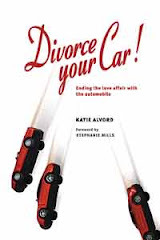 As of the 21st century, we have my own contribution to the literature, Divorce Your Car! which came out in May of 2000. And now we have another fine book, Carjacked: The Culture of the Automobile and its Effect on our Lives, by Catherine Lutz and Anne Lutz Fernandez. I’ve been reading this book lately, and I find its stories and analysis very insightful. I’m just about to finish Carjacked as I prepare to host a chat with the authors – that’s coming up tomorrow 3/20 from 5 to 7 p.m. Eastern time in the Book Salon of the Firedoglake.com website. We’ll be talking about Carjacked, and about questions like the one I raised in my title-composed-of-titles for this blog post. Please join us! we have been supplying body parts for cars and trucks for almost four decades,Whether you drive a new model or are restoring an older model, you can depend on iAutoBodyParts.com and our lifetime guarantee on your automobile or truck body parts.